Could we have available the skin template for the A4E? As I have said before we have some artists eager to work on the paint schemes of our beloved A4!!. Thanks again to A4E community for this amazing mod!!! Last edited by Gandalf_56; 11-19-2018 at 02:39 PM. Last edited by Vfa-81 Fix; 11-20-2018 at 12:34 PM. I'm having a heck of a time trying to figure out where all the files are that need to be created locally for the skins so I can properly view the model in ModelViewer. They packed them away in zip files spread across multiple zip files. Uggghhh! The skins loads properly in the sim, but not ModelViewer. Apparently, the roughmets are loaded somehow, but the description.lua file in the livery folder I'm using as a template mentions nothing of them. The skin I am working on isn't loading the roughmets and I have no idea where they are located. Here's my description.lua. Looks right, but references to the roughmet are not there. Works for default skins though. I don't get it. name = "VFA-204 River Rattlers 401 (c.1976)"
And here's what I'm getting. The base skins top and bottom load. No roughmets though. Last edited by Bananimal; 11-20-2018 at 07:15 PM. Here's what I have at the bottom of my ModelViewer autoexec.lua file. Not sure why the other textures aren't loading. As mentioned, the skin loads properly in the sim, but for whatever reason, while building the skin in the Bazar/Liveries folder, the call out to the other textures is failing. 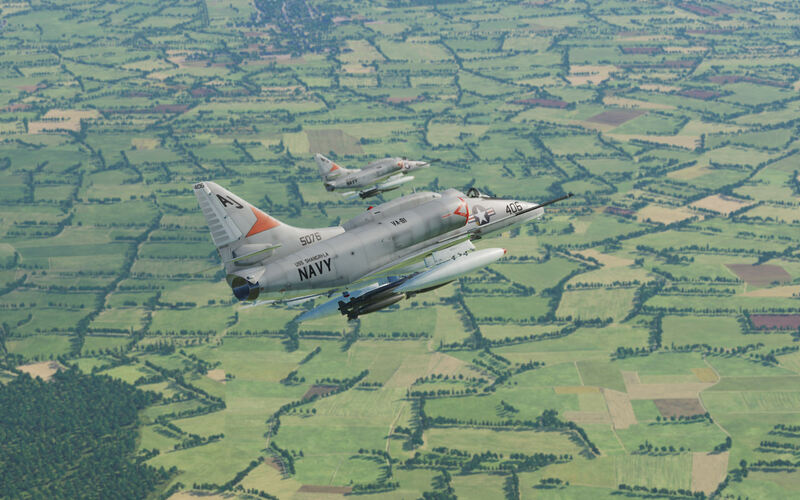 I copied the A-4E-C Textures folder to the Bazar/Liveries folder to no avail. I sure wish ED would fix this ModelViewer so we can point it to the files we want to load into it instead of guessing what we have to move into the Bazar Liveries folder. It's messy as all get out. An entire day wasted on trying to figure this out. I could have been done the repaints at this point. Seriously. Last edited by Bananimal; 11-20-2018 at 09:05 PM. Yeap the Model Viewer only reads liveries in the main DCS Folder. Now regarding decals, if Y place an "empty" in every Number, I should get no numbers right? And would you share your custom Tanks Template? This will allow you to load liveries from saved games folder. then you have to mount the textures, as the livery description.lua only tells the sim where specific files are and not all of them needed. And then lines for each zipped folder as well. Last edited by SkateZilla; 11-20-2018 at 11:59 PM. Challenge of the day. I don't know that this can be resolved. In the end, this skin and all work put into it for the last three days may have to be scrapped. Severe UV mapping issues on the A-4E hump. Here's what the snake looks like on the PSD followed by what happens to the texture when it is mapped onto the model in ModelViewer. UPDATE: It took me a total of 26 hours fiddling with this one decal to straighten it out. It's not perfect, but it is acceptable at this point. If you are planning on doing a skin with a decal on the hump, be advised, you'll have your work cut out for you trying to straighten it. Last edited by Bananimal; 11-25-2018 at 07:59 AM. -- English (US) -- Russian (RU) All times are GMT. The time now is 08:46 PM. vBulletin Skin by ForumMonkeys. Powered by vBulletin®.